Rank: #11 out of 123. 9" x 15" x 20"
WORX WG505 is a very popular and one of the less expensive options. It's in the top 3 bestselling leaf blowers and has dozens of popular alternatives in the same price range, such as BLACK+DECKER LSW221 or Weed Eater WE20VB . 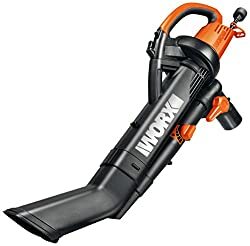 WORX WG505 is $33.70 less expensive than an average leaf blower ($95.70).